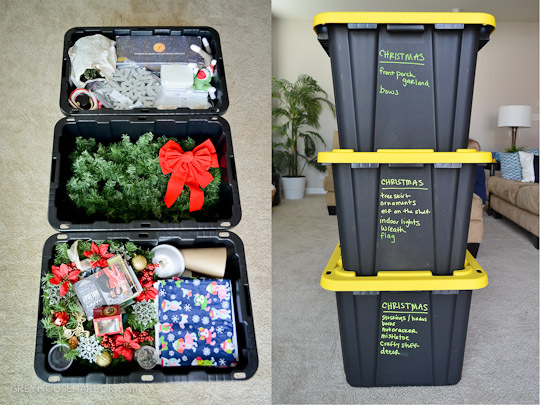 With Bug’s birthday so close after New Year, I have ample motivation to get all the Christmas decor packed up and back in the attic. 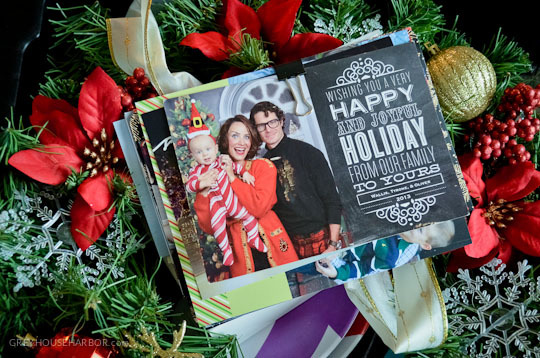 Lest the party photos be tainted by holiday clutter whose magic has faded – the horror! These super tough totes from Home Depot are my fave. 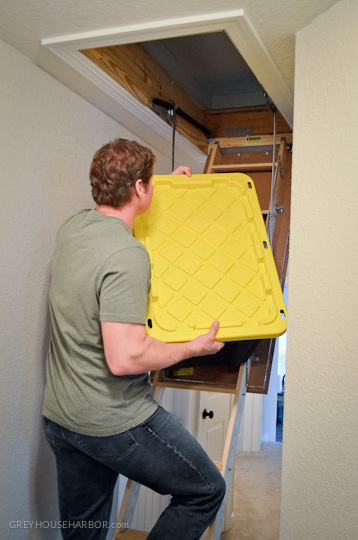 Extra sturdy, stackable, and they hold a ton of stuff without being too big to lift on my own. At $10 each, me likey a lot. 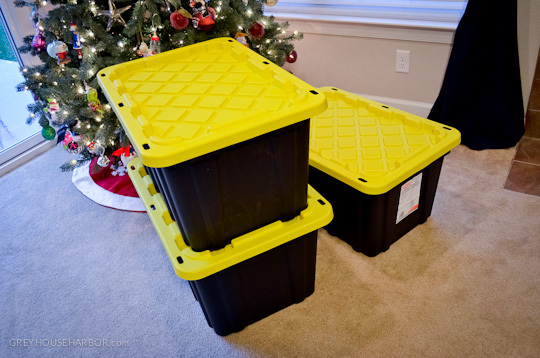 Some people prefer clear storage to see what’s inside, while others like the red/green totes to designate Christmas stuff. 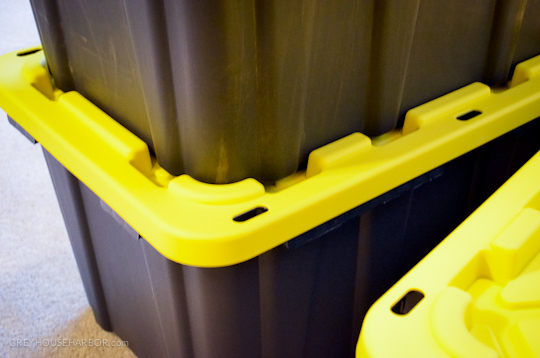 Personally, I think clear totes look messy and I like the way these can quickly be re-purposed for anything. 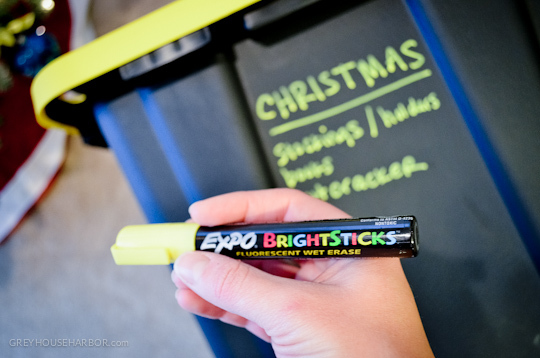 I bought a set of neon wet-erase markers to easily jot what’s in each box; even a year later it wipes off clean with a damp cloth, so I’m free to change it as often as needed. 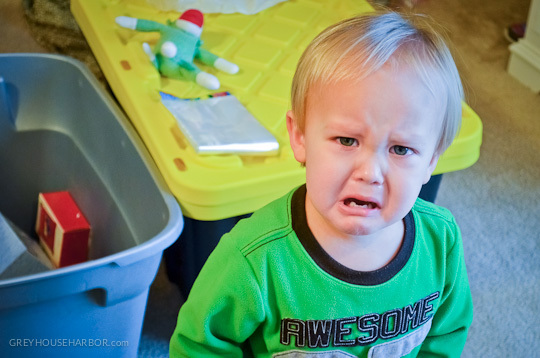 Somebody was NOT happy to see the nativity put away. It’s for your own good, buddy, I promise. 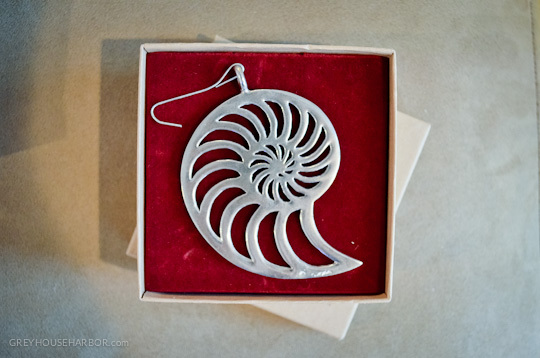 When removing ornaments from the tree, leave the hook on. Saves time now and next year, too! They say the difference between a hoarder and a collector is that a hoarder saves things indiscriminately and a collector gathers selectively. 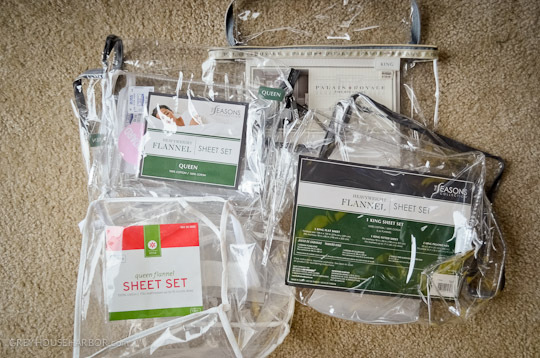 Or at least that’s how I justify my need to save bed sheet packaging. Am I the only one who thinks these little zippered pouches are just too neat to toss? Well, my stash has been vindicated! 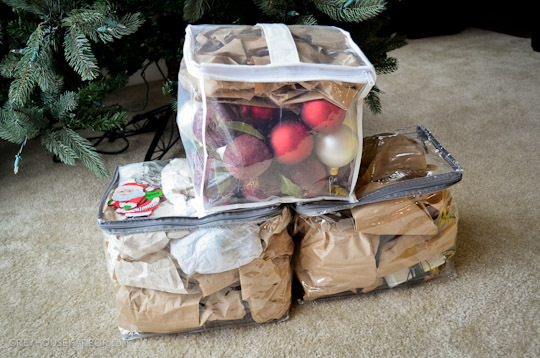 After years of putting wrapped ornaments into gallon ziplock bags, I had an epiphany. My bed sheet packaging collection finally found it’s true calling. Since this was the first year we did outside lights, I am determined to not let them be a hot tangled mess come December 2014. 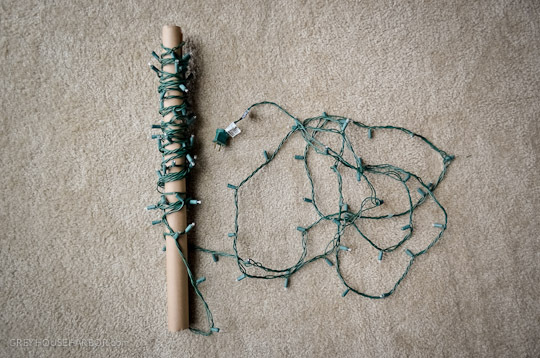 I saved the center of my gift wrap tubes, cut them small enough to fit into the storage totes, and then wrapped one light strand per tube. Not only will this prevent knots within each strand, but it also keeps multiple strands from becoming hopelessly snarled. 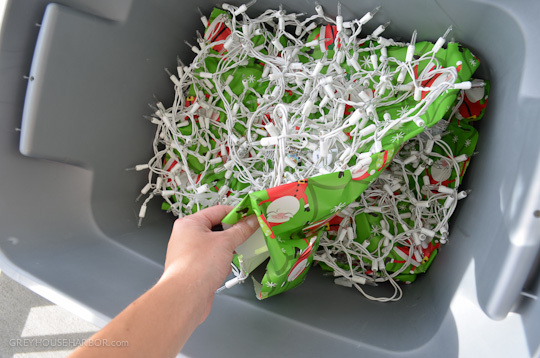 For icicle lights (or if you don’t have any tubes on hand), carefully coil each strand and place a generous sheet of wrapping paper between as you lay them into the tote. 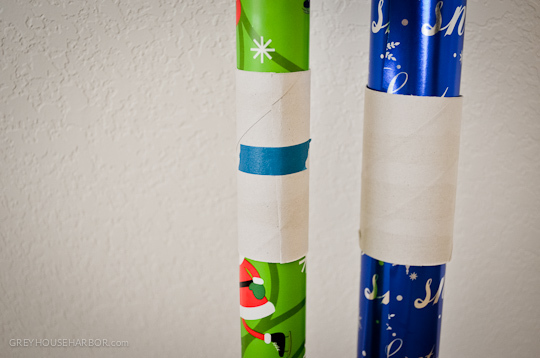 Empty toilet paper rolls make great gift wrap keepers. Cut down the long side and slide over, securing with tape if needed. One of my favorite parts of Christmas is opening the mailbox. It seems so sad to toss my “friends” in the trash recycling come January. So this year I’m keeping all your smiling faces tucked away amidst the decor. They will be a lovely reminder next season of how we’ve all grown (some more than others)!